“A first quantity of priority chemical materials was moved from two sites to the port of Latakia for verification and was then loaded onto a Danish commercial vessel today,” OPCW-UN Special Coordinator Sigrid Kaag said in a statement from the Joint Mission. Accompanied by naval escorts from Denmark, Norway and Syria, the ship has now sailed for international waters where it will remain “awaiting the arrival of additional priority chemical materials at the port”, Ms. Kaag added. “This movement initiates the process of transfer of chemical materials from the Syrian Arab Republic to locations outside its territory for destruction,” she said in the statement. Maritime security is being provided by naval escorts from China, Denmark, Norway and Russia. OPCW-UN encourages Syria “to continue its efforts to complete the removal of chemical materials as soon as possible in a safe and timely manner”, said Ms. Kaag, who is due to report tomorrow to the UN Security Council in New York. The OPCW Executive Council is due to meet at The Hague that same day. 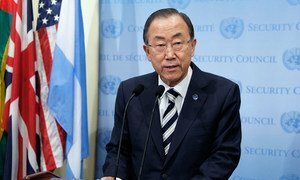 The confirmation was welcomed by UN Secretary-General Ban Ki-moon who called it an “achievement” in “the continuing progress in the international effort to eliminate the chemical weapons programme”, according to a statement issued by his spokesperson in New York. The removal of the chemical agents out of the country involves transporting them from Latakia onto commercial vessels provided by some Member States. They will then be loaded onto a United States ship and destroyed at sea using hydrolysis. In accordance with the decisions of the Security Council and OPCW Executive Council, Syria’s chemical weapons will be transported outside its territory to ensure their destruction in the “safest and soonest manner,” and no later than 30 June 2014. That deadline set will not be met owing to technical difficulties, the Joint Mission announced late last month. It stressed, however, that it would continue to assist Syria as specified under Security Council resolution 2118 and the decisions of the OPCW. The Joint Mission continues to coordinate with Syria and the other Member States, Ms. Kaag said, to mobilize resources and undertake all the necessary steps towards the complete removal and elimination of the chemical weapons programme.